BEIJING - China on Monday unveiled photos taken by its second lunar probe of the moon's surface, marking the success of the mission. "The relaying back of the pictures shows that the Chang'e-2 mission is a success," Zhang Jiahao, director of the lunar exploration center under the China National Space Administration, said. 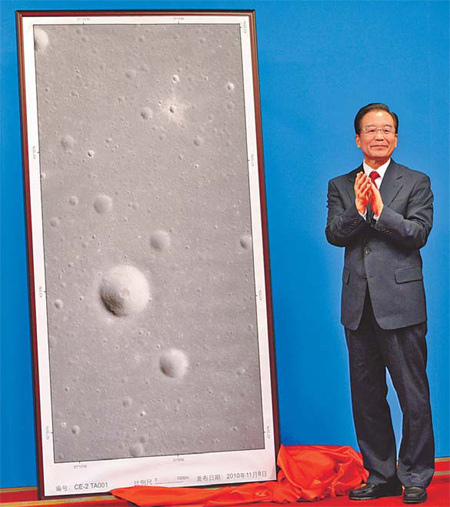 Unveiled by Premier Wen Jiabao, the photos highlighted part of the moon's Sinus Iridium, or Bay of Rainbows, the area proposed for China's first unmanned soft-landing around 2013. One of the pictures, taken on Oct 28 from 18.7 kilometers above the lunar surface, shows an 8-km-wide, 15.9-km-long area of the Bay of Rainbows. 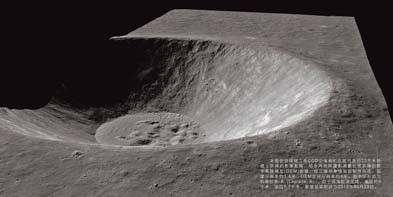 It shows the surface is "quite flat" with craters and rocks of different sizes and a large hole with a 2-km diameter, a statement by the administration said. The bay was formed by a massive impact billions of years ago, and is considered one of the moon's most beautiful landmarks. But the bay is only one of the proposed spots for the unmanned landing attempt, as Chang'e-2 has also taken images of other possible landing areas, said Yan Jun, chief scientist of China's lunar exploration project. "The exact spot for a soft-landing has not been decided yet," he said. The Chang'e-2 probe was launched on Oct 1 and went into orbit eight days later. It first circled the moon at a distance of 100 km, and then dropped into orbit about 15 km above the lunar surface. After taking the images it will return to a 100-km orbit to conduct a study of the lunar surface. The probe was designed to test technology for Chang'e-3, which will land on the lunar surface and release a moon rover around 2013. The lunar pictures have a resolution of up to 1.3 meters, much clearer than images taken by its predecessor Chang'e-1, with a resolution of 120 meters. "With such a high resolution, it means that from the pictures you can tell a pit of 4 meters in diameter on the moon or a rock with a diameter of 3 meters," Yan said. In the next five months, Chang'e-2 will continue taking pictures of the moon and conduct scientific experiments to refine the findings recorded by Chang'e-1, according to the center's director, Zhang. "Thanks to accurate maneuver efforts, which allowed the Chang'e-2 probe to enter orbit without using too much fuel, the circumlunar satellite will be able to work longer than its designed lifespan of six months," Zhang said. But it is still unknown how Chang'e-2 will end its mission. Possible scenarios include crashing into the moon like its predecessor, flying into deep space or flying back to Earth. China's first lunar probe, launched in October 2007, ended its mission by crashing into the moon after orbiting for 16 months. Among other achievements, it acquired a three-dimensional map of the moon's surface. China has a three-stage lunar exploration program, with both Chang'e-2 and Chang'e-3 part of the second stage leading to an unmanned moon landing. The third stage aims to bring a moon rock sample back to Earth in 2017. There is no official plan for a manned landing yet, but earlier reports quoted top scientists as saying that China will be able to send men to the moon around 2025.